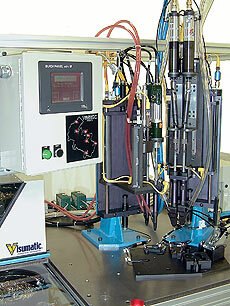 7-Spindle Turnkey System | Automated Fastener Feeding & Driving Equipment from Visumatic. 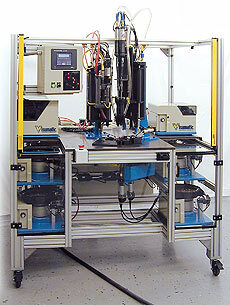 Application: Fully automatic system drives multiple screw locations, independently or together. This turnkey, standalone seven-spindle automated assembly station assembles four different styles of parts and has an inverted, three-spindle, a two-spindle VPD 4.2 Power Driver and two individual screw drive modules mounted on a Visumatic Power Slide. All spindles have independent suspension and can drive screws individually, or together. A complete automated system includes fixturing mechanism, touch-screen graphic operator interface panel and PLC controls designed and built in house by Visumatic. - Powder-coated tubular steel painted to spec. Customer Specific. Multi-Location. Built Better.